Ferguson police shooting: Man shot at officers who returned fire, St. Louis County PD says. 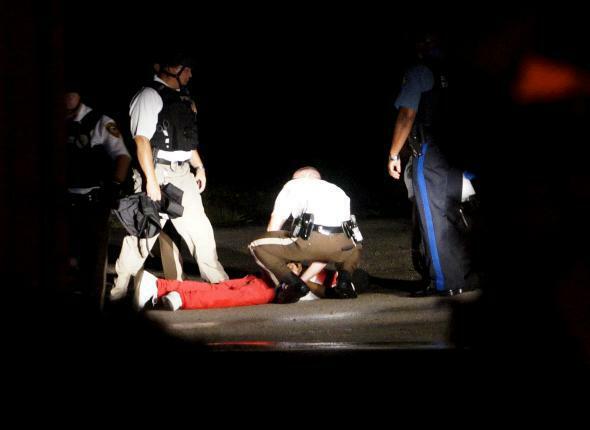 A wounded man in Ferguson, Missouri who reportedly shot at officers before they returned fire toward him. Update, 2:55 p.m.: Tyrone Harris has been charged with a number of crimes and is in critical condition, a St. Louis County police release says. The shooting came after rival groups began shooting at each other on the west side of West Florissant Avenue, the center of the Ferguson protests, Chief Jon Belmar of the St. Louis County Police Department said … The injured man, who was not publicly identified, was part of one of the rival groups, the chief said, and four plainclothes officers saw him running across a parking lot on the opposite side of the avenue. The officers drove their unmarked sport utility vehicle, with its interior lights flashing, toward him, and he opened fire on the car, Chief Belmar said. The police returned fire from inside the car and then chased the man on foot, he said. Dozens of gunshots were fired, and all four officers shot back and hit the man, who fell to the ground, he said. The shooting reportedly took place at about 11:15 p.m. Earlier, several individuals had tried to rob a cash register from a beauty supply in the area of protests before abandoning it as police pursued them. A St. Louis Post-Dispatch reporter named Paul Hampel subsequently reported that a different beauty shop had been broken into; Hampel was then attacked himself and bloodied, the Times says.